Every single bikerider has been there, and since you are here on my blog right now, you are having one of these moments: You want to buy something that will make you go faster on your bike, but you dont have the budget to go all the way and buy a set of Lightweight Obermayer wheels. What to do then? You maybe have 1000 dollars to spend, which you could get some nice wheels for, which usually is the thing people tell you to buy to get fastest the best way. But will this be the best way to go faster for that budget? According to their tests, the Continental GP4000S was the tyre with the lowest rolling resistance, and comes in with a 34,3 Watt's of rolling resistance at 35 km/h. On the other end of the scale, there's the punctureresistant Continental GP 4 Seasons, that comes in at 53,9 Watts rolling resistance at the same speed of 35 km/h. Thats a massive difference of 19,4 Watts! For many riders thats about 10% of their total power they could save by changing from one to the other! Now lets turn over to the wheels. Will there be a greater resistance here? Lets turn back to Tour Magazine, who tested both lowprofile, and highprofile wheels not long time ago. A link to that test can be found here: [http://www.tour-magazin.de/services/qtr/epaper_4_2011/page104.html] (The tests starts from page 86 and forward). In the test they measured the windresistance of the wheels, and lets try to compare a cheap lowprofile wheel against a Zipp 404, the most common high-end wheel out on the roads. 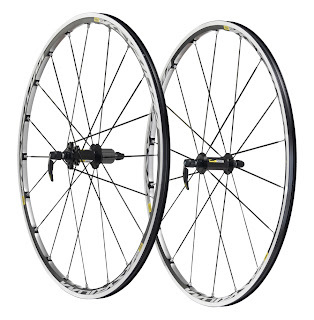 As a cheap(ish) budget wheelset, lets take a Mavic Ksyrium Elite, which comes in at around 700 dollars. At 30 km/h, this wheel produces a total amount of 7,7 Watts of drag, which is way lower than the 34-53 Watts the mentioned tires above produced at about the same speed. What about the Zipp then? At 30 km/h, they produce 4,5 Watts of drag, which means these 3600 dollars wheels only saves you 3,2 Watts.. Can we agree, that at these speeds, it would make way more sense spending 100 dollars to get some very good tires with low rolling resistance (capable of saving you 19,3 Watts per tyre! ), instead of bursting your bankaccount for not even 4 Watts? But of course rolling- and windresistance changes differently. Rolling resistance increases in a linear curve compared to the speed, while if you double your speed, your windresistance has increased 4 times as much as your speed. So the windresistance increases a lot more than the rolling resistance, as the speed improves. So the higher the speed, the greater the difference will be between the 2 wheels. A lot more, than the difference between the 2 tires. 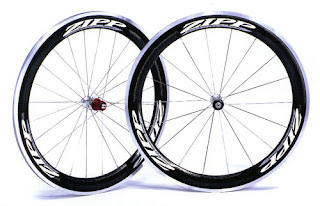 But how high must the speed have to be in order for the Zipp-wheels to be a better buy than the 2 tires that costs only a 36th of the Zipp-wheels? At 40 km/h, the Mavic-wheels produce a drag of 18,2 Watts, while the Zipp-wheels produce a drag of 11,0 Watts, so a total saving of 7,2 Watts, going at a normal racespeed. Here the difference between the GP4000S produces a total amount of 39,2 Watts, while the GP 4 Seasons produce a total of 61,6 Watts. 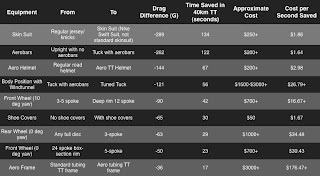 So with the tires you can save a total amount of 22,4 Watts, or what compares to 3 times more energy saved, than going on Zipp 404's. Well, lets say it goes a bit downhill then, and we are at 50 km/h. 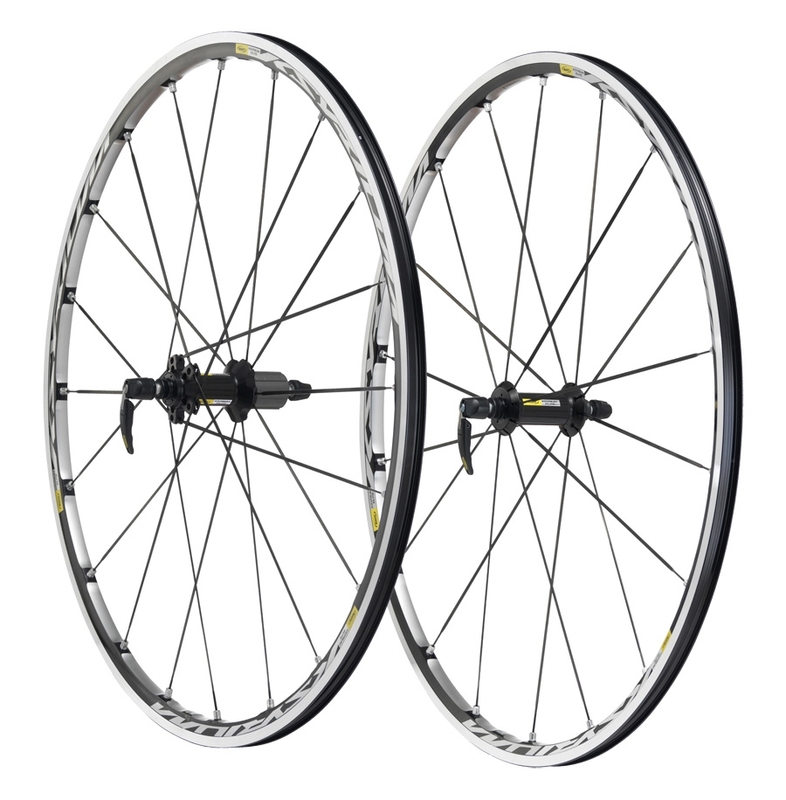 Here the Mavic-wheels produce a drag of 35,6 Watts, while the Zipp's are at 23,3 Watts. A total amount of 12,3 Watts are now being saved. But the difference between the 2 tires are still greater. 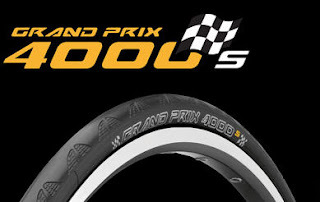 The GP4000S produces a rolling resistance of 49 Watts, while the GP 4 Seasons are at 77 Watts. A total difference of 28 Watts, still 5 more Watts to save on the right tires, than the very very expensive wheels. So you will have to go a little bit above 50 km/h, before it would make sense to buy the Zipp's before changing your tires to low rolling resistance, and then think about, how long time on your trainingsessions, are you actually going at this speed? Not much properly, unless you live on the top of a mountain. Therefore, my best advice for anybody, if they want to go faster on their bike for a small budget, is, go out and buy some good tires before changing to a expensive wheels, because you get a lot more speed for your money for changing tires. 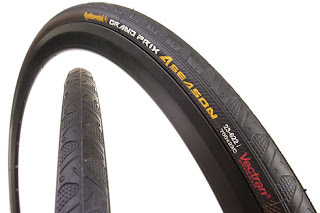 I know several people who actually ride these 2 types of tires i mentioned above, and they claim they ride up to 3 km/h faster on the Continental GP4000S than the GP 4 Seasons. That is a big difference! I myself, tried changing from some Continental Ultra Race to some of the mentioned Continental GP4000S-tires, and on the very first workout, i set a new record on a 40 km-course i usually ride when I get home from University, and just have this 1½ hour before dinner is served. Clearly the tires makes a difference. So as Yokohama says about their tires; "Its the tires that makes your car", I can tell you, that the tires also makes you go faster on your bike. But if you are doing a time trial, there are other factors that will help you a lot too. Aerodynamics are very important here, because you cant hide in a peloton. 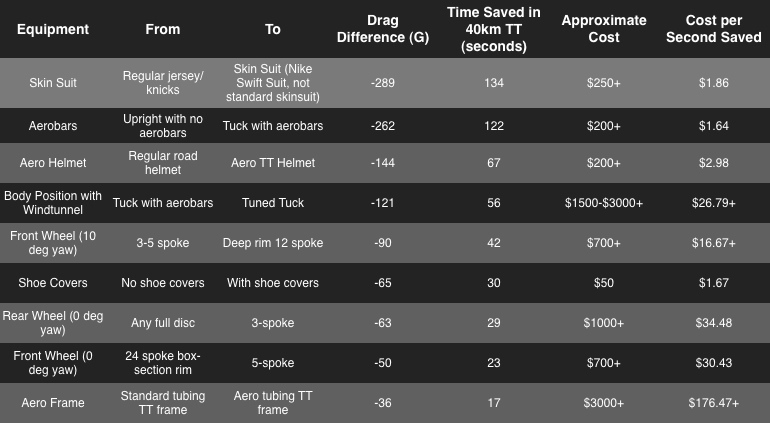 Australian bikesite Cyclingtips.com.au have this helping table you can see below, where it gives an indication of how much you can save over a 40 km course, driven in 48 minutes as the standard. So its a lot faster than a "normal" guy could do, and therefore the difference for any ordinary rider would be lower than indicated below. But it gives a good idea of where you can get most speed for your money. Some of your numbers are a bit off. Assuming your 4,5W for the Zipps at 30km/h, at 40km/h they require 4,5*(40/30)^3 = 10,7W rather than the 11,0W you state. Similarly, at 50km/h, they require 4,5*(50/30)^3 = 20.8W rather than 23,3 as you write. The force required to overcome aero drag goes as v^2, but the power goes as v^3 (which is what you would use if you want to compare to the linear relationship for power required to overcome rolling resistance vs. velocity). There is always a difference between theory and practice, as this example so ably demonstrates. The measured power requirements are correct. Asad: The numbers used here was the measured numbers of the tests, not any bad calculations.